It’s getting cold, and we all want something warm to bundle up in. Other people might go to the store and buy a cute new sweater. 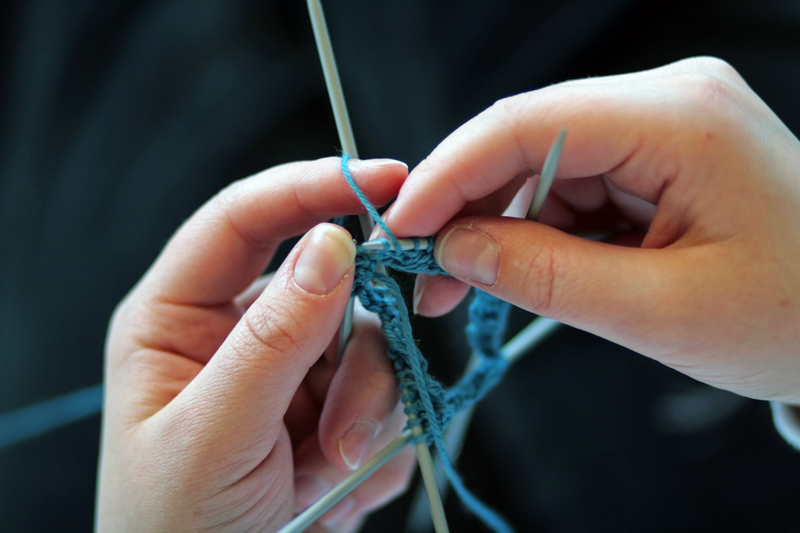 But for us knitters, the first impulse is always to knit one ourselves. 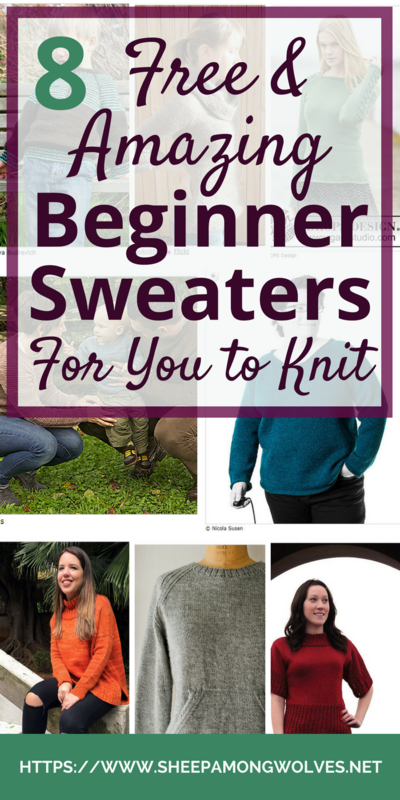 You’ve never knit a sweater before and are a beginner? Doesn’t matter, you can knit a sweater! It’s not all that difficult it just takes longer. 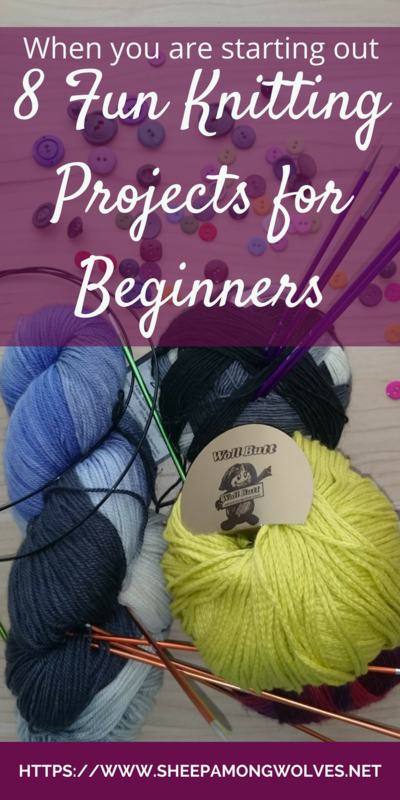 To get you started, I have a few general tips here and a list of pretty free patterns for you to choose from! Can’t stress this often enough: Knit a gauge swatch! Or two or three! Only a swatch can tell you if your gauge is similar. Without one chance are that the finished sweater might not fit as well as it could. Use a yarn similar to the one in the pattern. Not just yarn weight but also fiber content. 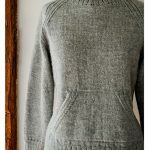 Different fiber content might create a different drape, and the finished sweater may not look like you thought it would. Take notes! It makes it easier to reproduce the same outcome, and if something worked very well (or not at all), you might be able to figure out how to do it again (or avoid it). Also, it’s helpful when you are trying to get two sleeves of the same length. Know your measurements. You can’t make a sweater fit if you don’t know how big or small, how short or long you are in certain places. For example, I’m bottom-heavy. My hips are wider than my bust and usually need a size larger than my bust does. Since I know this, I can alter patterns accordingly or just choose a size that fits my hips and have extra positive ease in the bust. 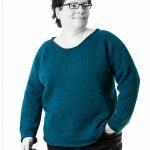 Look at this previous post (“How to Best Use Patterns and Have More Fun Knitting”) of mine for more tips on getting the most use out of patterns. 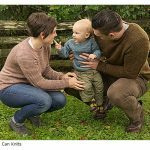 I’ve found eight free sweater patterns for you, and as a bonus, I’ve added five purchasable sweater patterns suitable for beginners. 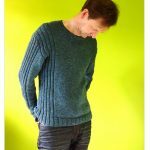 I’ve knit Flax Light before and wrote a review of this pattern. 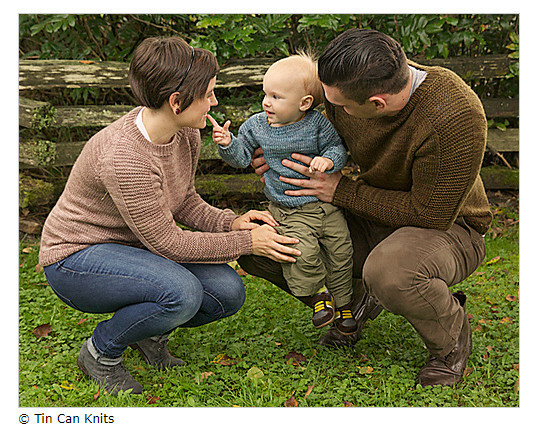 I know I keep saying it, but I love Tin Can Knits patterns. 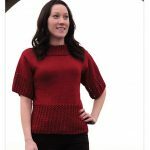 Their Simple Collection consists of 10 different free patterns together with tutorials teaching you the knitting skills you need for these projects. 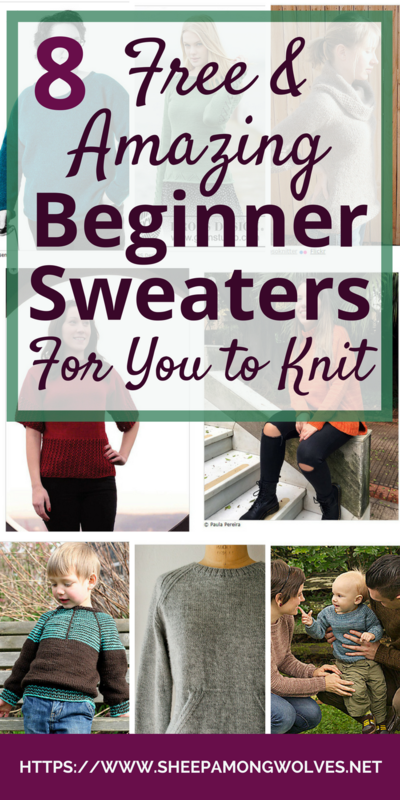 All of the designs are simple but stylish, and I would always recommend them to beginner knitters. Plus: They are all available in sizes from baby to adult. This is a very comfortable looking and uncomplicated sweater. A wonderful everyday wear. You get to knit a pouch, and it’s all seamless! Now I know of the merits of seams on a sweater (stability, keeping the shape, etc.) but I know they can be scary when you are starting out. And they can make or break a sweater. Trust me; I’ve made a one (in my earlier knitting years) that was great until I sewed in the sleeves. The pattern comes not just with very detailed instructions but also with lots of pictures showing you some of the trickier parts. And the pouch is entirely optional. I must say it’s itching in my fingers to cast on for this sweater. 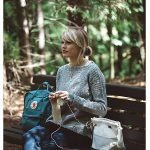 I’ve never knit a pouch before and would like to try it out. Purl Soho is another nice site with tons of free beautiful patterns for beginners. Raglano is a pretty basic raglan sweater that is, however, a great beginners project as you don’t need to worry about obtaining gauge. You just need to have enough yarn to finish. Children’s clothes are wonderful beginner projects because they don’t take as long. You get to test it out your sweater making skills on a smaller scale. 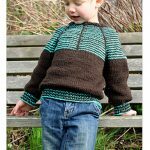 This sweater is a charming unisex design with some colorful (and easy to do) 1-row stripes. Perfect for using up some leftovers. Again it’s itching in my fingers to cast on for this myself. 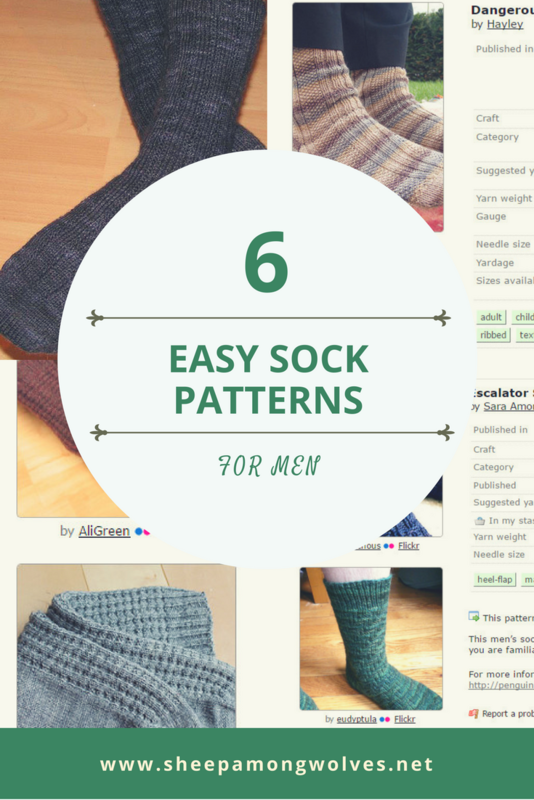 The pattern is short and easy to read. And it includes color-coding of the instructions for the different sizes. That is an excellent idea since you should highlight your instructions anyway. 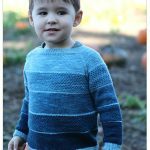 If you don’t know Drops Design yet: They have a ton of free patterns. (Not all of them are suited for beginners.) The patterns are all knit in their yarn lines. I’ve tried out quite a few Drops yarns over the years since they are quite affordable and I’ve liked most of them. 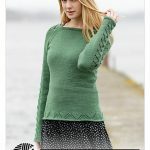 Green Forest is a feminine raglan sweater with a lovely lace motif at the hem and running over the sleeves and shoulders. The pattern is quite easy but not as easy to read. I recommend printing it out and preparing it. The schematics at the end, unfortunately, don’t say if they are in inches or cm but looking at the numbers I’d say it’s inches (38 cm is bit small for an adult’s bust size). 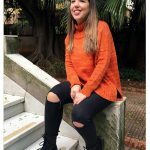 Talula is an attractive boxy, oversized sweater with overcut shoulders, an interesting neck and a “Vokuhila” cut. That stands for “vorne kurz, hinten lang” – frontside short, backside long. It used to refer to the 80’s mullet, but nowadays it’s mostly used for clothing here in Germany. I haven’t been able to find a similarly concise term to describe this kind of cut in English. If you happen to know of one, please enlighten me and leave it in the comments. You will have to do some seaming. 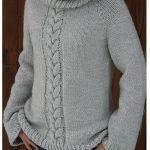 The shape is simple, however, and you knit the sleeves directly onto the body, so it’s a nice beginner seaming project. 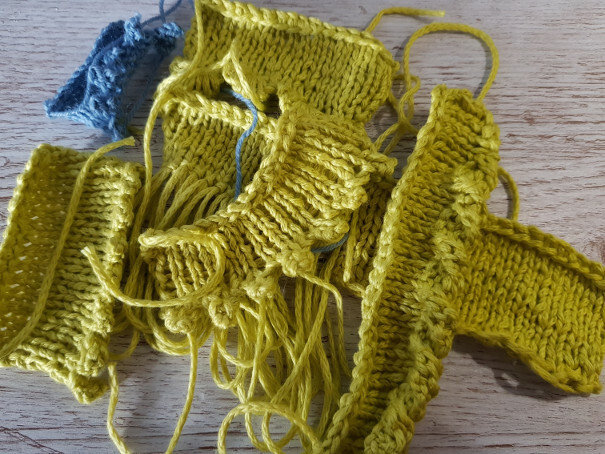 There are also some short rows involved in knitting the shoulders, so maybe practice those first in a swatch or two, if you’ve never knit them. This is another seamless sweater with raglan sleeves. That is always nice for beginners because you can test the fit of the sweater before you’re done. Bonus points if you wash it while on the needles to see if the gauge is still correct. It has a cowl neck that you knit on at the end and some waist shaping. The sleeves are three-quarters long and flare a bit. It’s a cute, feminine sweater for warm autumn days that don’t require a jacket or coat (such sleeves tend to annoy me then). The name doesn’t really roll off the tongue but it’s a very pretty and feminine top. The lace rib is quite simple and easily memorized. I would have liked to see a chart included alongside the written instructions anyway. Just to cover both people who work better with charts (like me) and people who work better with written instructions. There are a few seams for you to practice on here. But they are all straight edges and not too tricky to sew up. Now on to the Purchasable Patterns! This is a men’s sweater that I think would work just as well for a woman. It does have some seams, but they appear to be all on straight edges again. I love its simplicity. This looks like a comfortable sweater great for layering up with during these colder months. Unfortunately, I can only see the German Crafsty prices. They are always displaying prices including taxes based on the country you are in, so they may vary depending on where you are. 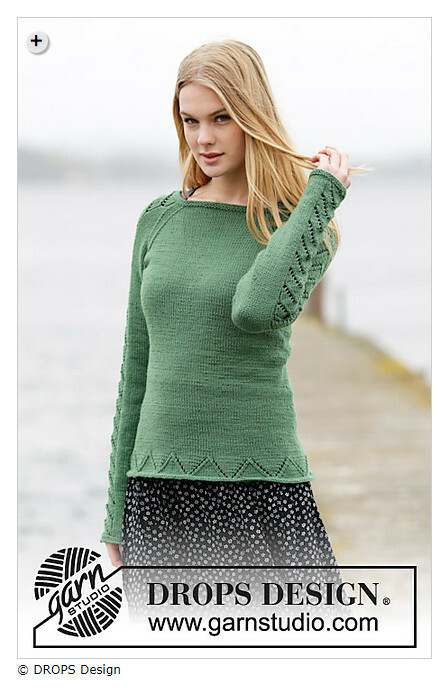 Craftsy lists a price of €5.90 (*) for me whereas Ravelry sells this pattern for USD 8.21 (currently that’s about €7.20). 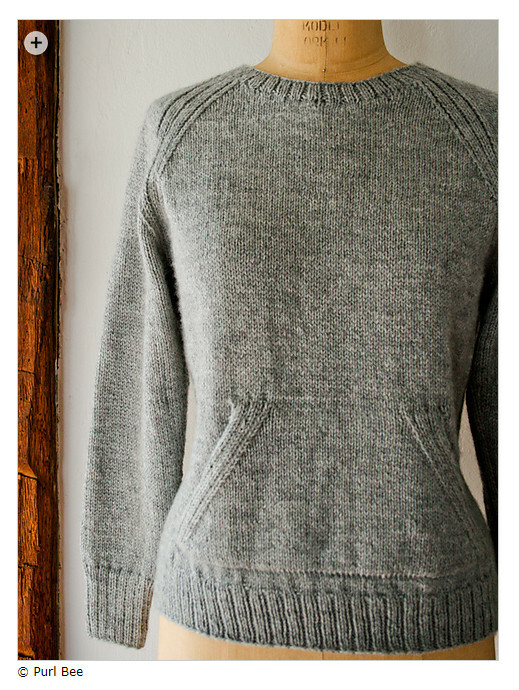 Nele is a beautiful yet simple top-down raglan sweater. The stripes offer a bit of variety and invite you to play with colors. The sample in the shop only uses to beige tones but if you wanted you could work every stripe in a different color. Or use a color gradient as your contrast yarn. There are many possibilities. The German Crafsty price is €1.71 (*) (again prices may vary depending on the country you live in), on Ravelry it’s available for €2.00. 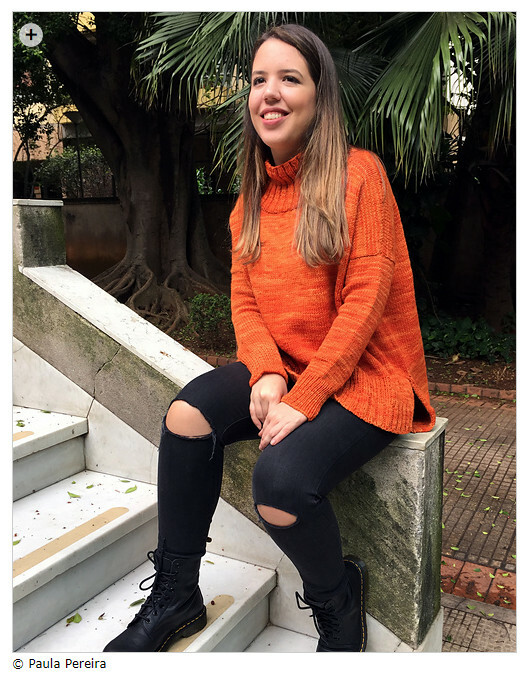 This turtleneck sweater features an easy, eye-catching cable running down its center. And in bulky weight yarn, it should knit up pretty quickly. You knit in the round; therefore you don’t have any big seams to worry about. 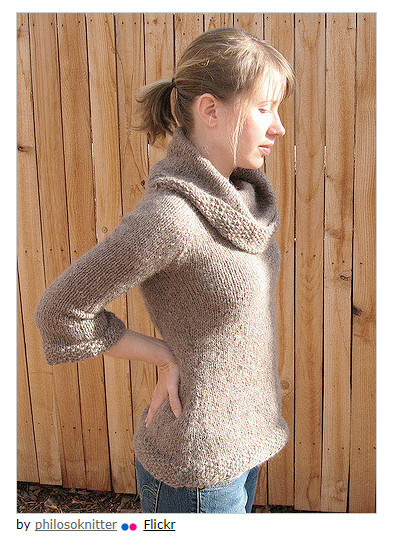 I usually don’t like the look of bulky weight yarn, but here it looks cute and comfortable. And I love knitting cables. 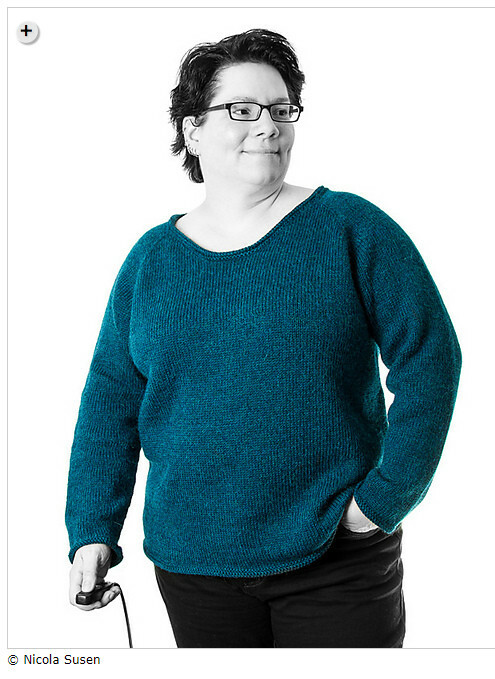 The purple sweater (shown on the Craftsy page) includes some modifications. The original version has wide sleeves. The German Crafsty price is €4.27 (*). 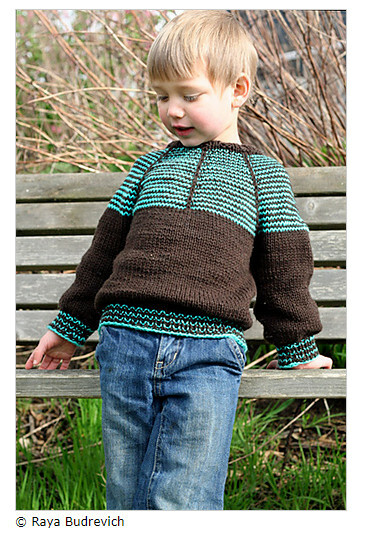 On Ravelry, it’s available for USD 5.94 (or about €5.21) or in a bundle with five other patterns for USD 9.51. 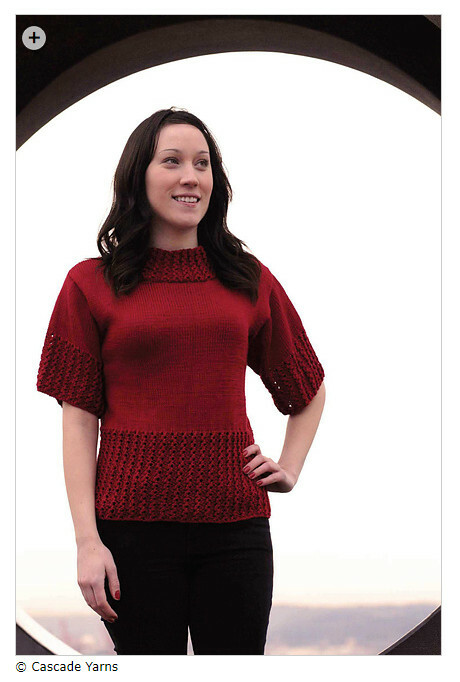 The Weekender is a brand new design by the wonderful Andrea Mowry of Drea Renee Knits. Another seamless design but this time from the bottom up. It has a beautiful neckline and shoulders and looks wonderfully cozy. And you get to try out tubular cast ons and bind offs! I love stripes. And this little kids’ sweater is just the cutest thing ever. There is some texture and nice wide color stripes separated by thin stripes. It’s perfect for playing with color and even using up leftovers. And again there are no seams for you to worry about. It is a top-down project, and this happens to be toddler sweater. So keep in mind that toddler’s heads are proportionally rather large and it’s difficult to dress someone who’d rather be playing. That means you should use a very stretchy cast on for the neck. This pattern is available on Ravelry for USD 7.14 (or €6.28) and if you choose to buy it today (November 17th) it is still 25% off if you use the coupon code on the Ravelry pattern page. What did you think of these sweaters? Which was your favorite? And which ones do you think are missing from this list? Please let me know in the comments below. I know I missed last week. Real life got in the way and I just needed a little breather. But I used the time to plan ahead and I’ve already started working on next weeks post. It will be all about decorative cast ons. Here is a little sneak peak. Affiliate disclaimer: This post contains affiliate links (links marked by (*)). That means that at no extra cost to you I will receive a small compensation should you choose to purchase after clicking on such a link. Please, read this for more details. Did you enjoy this post? Then please share it on Pinterest!